Do you know how to contain a grease fire? Most people don’t. 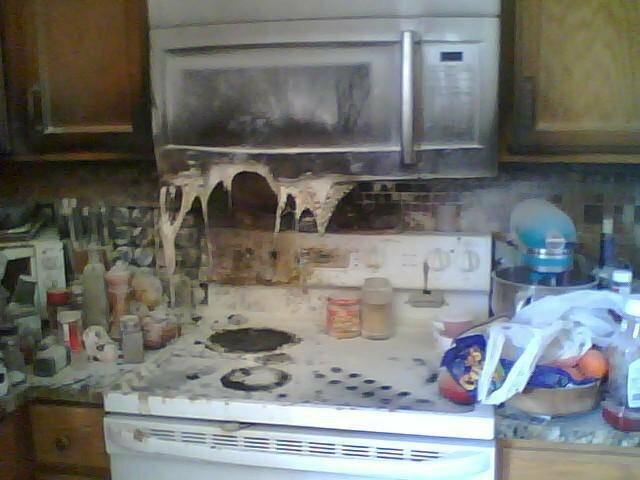 The picture below will show you what happens when a grease fire gets out of control. My oldest niece, who recently graduated from culinary school around the same time this fire happened (I know, it’s hysterical), now knows what a grease fire is like. She used a fire extinguisher. I’m guessing that’s because the fire got completely out of hand, judging from the photo. However, she and I no longer speak to one another so I had to pull this from Facebook. But if the grease fire has just started, cover the pan with a lid quickly. Do NOT spray water on a grease fire EVER. Water and grease don’t mix together well. The water makes the grease pop, and what happens when grease pops? It pops right out of the pan. Kind of like when you’re cooking bacon. But the most important rule of this tip is that if you’re ever cooking something greasy, like bacon, do NOT walk away from the pan, even for a minute. That’s why the microwave above is melted. She walked away. If you have to leave the stove, either turn off the burner or remove the pan from the burner. Next postIt’s My Party . . . Excellent tip for all cooks everywhere. At least said niece knew how to use a fire extinguisher… this fire could have taken the whole house if she hadn’t moved quickly.